Posted March 25, 2017 by San Luong & filed under Appetizer. The filling needs to be as dry as possible, as wet filling will create steam during frying, causing the crust to inflate and crack. The best way to solve this is to make sure all the ingredients in the filling have just very little amount of liquid, if any; and after shaping, let them rest for 1 – 2 hours to allow the dough to pull more liquid out from the filling. Make sure they are totally immersed in the oil during frying ; otherwise the unevenness in temperature inside the ball will cause it to inflate and crack at the area where it is not fully dipped in oil. Double fry the balls; first at medium heat to ensure balls don’t puff up too quickly which causes cracking; then second time at higher heat for a crunchier crust. I know it may seem intimidating but let’s not worry because I will guide you through the making of this delicious snack step by step. Let’s put on the apron and get started! 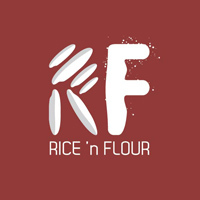 Note: I use Thai brand for both glutinous rice flour and regular rice flour. If you are grinding your own flour, make sure to adjust the amount of water used as the flour will already be wet. A detailed recipe with all the specific notes is available on Savoury Days’ YouTube Channel (subscribe to get all the newly uploaded recipes) in both English and Vietnamese (select your preferred language by clicking CC > Setting > Language). You guys can check it out at this link or the video right below. 1. Steam or boil potatoes/yam till soft. If you don’t have any of these, substitute by using 50 gram potato starch. 2. Mash the potatoes/yam until smooth. 3. In a big bowl, combine glutinous rice flour, rice flour, and salt. Mix well. Create a well in the middle of the flour and add in the mashed potatoes/yam. 4. Gently pour in lukewarm water, start with 170 – 180 ml. Using a spoon, mix them in a circular motion, starting from the outside. When the dough has become somewhat corporated, knead it by hand. Slowly add more water in and keep kneading until we get smooth, elastic dough. * Note: The amount of water varies depending on types of flour used and its water absorption capacity. In general, savoury rice cakes should have more water. The water helps to achieve chewy dough and prevent it from cracking when kneading. In addition, during frying, high hydration dough rises better. 5. Wrap the bowl tightly with plastic wrap and let dough rest for 30 – 60 min. It is also recommended to let the dough sit for a few hours or overnight in the fridge, covered. 1. Soak glass noodles and wood ear mushrooms in lukewarm water for about 5 – 10 min until soft. After 5 – 10 min, drain the water and squeeze all the excess liquid out. Slice the wood ear mushrooms into thin slices. Cut the glass noodles into 2 – 3 cm strands. 2. Peel and shred the carrots. Dice the onion. 3. Put together ground pork, carrots, onion, wood ear mushrooms and glass noodles into a bowl. Add in oil and seasoning powder or salt. Mix well, then divide into 12 portions, each weighs ~25 gr. * Note: the wood ear mushrooms and glass noodles need to be very dry when mixed with the rest of the ingredients. Having filling that is too wet will make the rice cake crack when frying. 4. Divide the dough into 12 portions, each weighs roughly 50 grams. 5. Slightly flatten a piece of dough and roll it so that the outer edges are somewhat thinner than the center. Place the filling in the middle of the dough. Shape it so that the filling entirely sticks to the dough and there is no air in between. This is very important because trapped air will cause the rice cake to crack during frying. Make sure the dough is completely sealed up, shape it into an oval and place aside. Repeat the step with the remaining dough and filling. The dough needs to have enough hydration, meaning it should feel soft and stretchy, not crumbled. If the dough does crumble, damp your hand with some water and gently knead the dough between the hands. Water will absorb into the dough, making it less dry. Make sure to cover both the filled and unfilled dough balls with plastic wrap to prevent them from drying out. 6. Once done, let the dough rest for at least 1 hour. Cover them with plastic wrap the entire time. In the meantime, prepare pickled vegetables and fish sauce. 1. Peel the green papaya (or chayote squash). Cut it into long pieces, then cut again into thin slices. Transfer the papaya slices to a colander and sprinkle ½ tsp salt on top. Mix well for 1 min, then wash again through cold water and drain. 2. Peel the carrots and cut into pieces of 7 – 8 cm long. Cut a thin groove all the way down one side of the carrot piece. Repeat four more times, keeping an even distance between each groove, about 1 cm. You will see the flower shape emerging. Slice the carrot piece thinly all the way down its length. The resulting pieces will each have a flower shape. 3. Put the green papaya and carrots in a bowl. Add sugar and mix well. Leave it there for 30 min. This helps the vegetables to retain its freshness and crunchiness. 4. After 30 min, add in lime juice and seasonings, mix well. Cover tightly for the seasonings to sip into the vegetables. 5. In another bowl, put in 25 gr sugar, 15 ml lime juice and water. Mix well and taste. Note that the amount of sugar and lime juice here are for reference only. You can also adjust them to taste. In this step, we would want a balance of sweetness and sourness. Slowly add in fish sauce and mix well. Again, the amount of fish sauce is for reference only. Thus, you should add it in spoon by spoon and taste in between. Once done, cover the fish sauce. Prepare the sauce early helps to bring out more flavor in the sauce. It is recommended to do this before making the filling. 1. Pour oil into a saucepan. 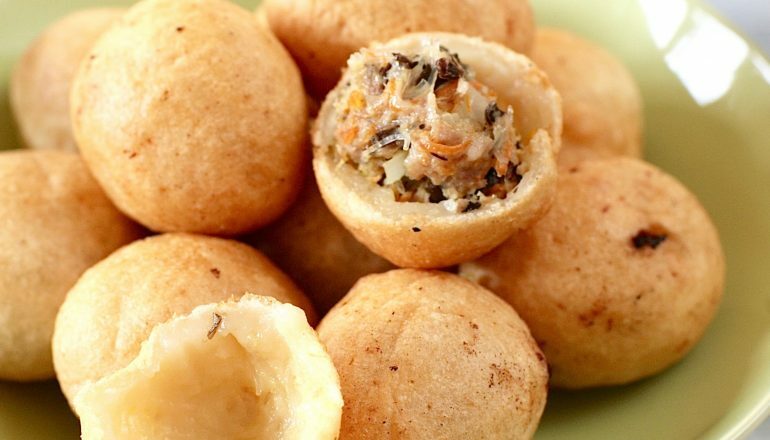 It is recommended to use a small pan or saucepan so that the balls are fully dipped in oil. Smaller pans will save more oil. 2. Heat the oil up at medium heat. The oil should be at ~150 – 160˚C when you put the balls in. The oil should not be hotter than 170˚C as such high temperature will cause the balls to crack. On the other hand, it should not be less than 130˚C which will result in balls that are hard and chewy. If you don’t have a thermometer at home, another way to make sure the oil is at the right temperature range is to dip a wooden chopstick into the oil. If the oil starts steadily bubbling around the chopstick, then the oil is hot enough for frying. If the oil bubbles very vigorously, then the oil is too hot and needs to cool off a bit. 3. Start putting the dough balls into the hot oil. After 30 – 45sec, when the surface of the balls shrinks a little, swirl them around using a pair of chopsticks so that they don’t stick to each other. 4. Fry at medium heat, around 150 – 160˚C. When the balls rise to the top, it means the filling is cooked through. However, at this time, the crust is not yet brown. Keep frying for another 5 – 10min, constantly swirling the balls so the crust can get even browning. The total frying time should be around 15 – 17 min. 5. At this point, if the balls are still not yet crunchy, fry them for another 5 – 7 min at higher heat (170 – 180˚C) until the crust is crunchy and golden brown. I would recommend to follow this double-fry method as the balls will remain crunchy for a longer time. There is air between the dough and the filling. Dough is too thin as compared to the amount of filling. When the filling is cooked, it will expand a little, causing the dough to crack. Dough is too dry and air gets in during shaping. 7. Serve with some fish sauce and green papaya/chayote squash salad on side. You can also add some Sriracha (hot sauce) as an option. Dip the fried cakes in a generous amount of fish sauce and serve hot. 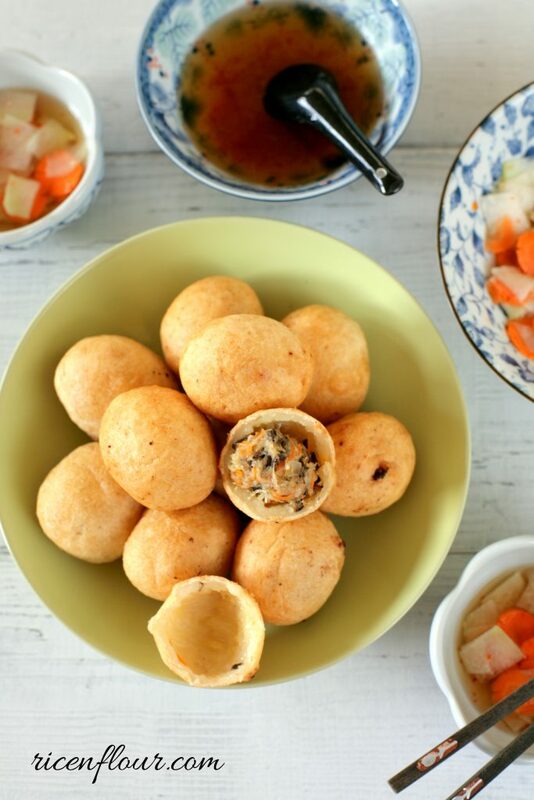 A successful batch of fried glutinous rice cakes will have crunchy golden crust and thin chewy dough inside. The exterior should rise and be separated from the filling. Dough does not crack, and filling is soft. If the cakes do not rise as much as they should, it is either because the dough is too dry or the heat during frying is too low. If cakes are hard, it is because they have been deep fried for too long at too low heat. Dough crumbles, difficult to wrap: dough is too dry. During frying, the crust cracks or explodes: see step 6 above. Ball is not smooth: dough is too dry and crack during shaping. Ball is chewy or hard, undercooked: frying temperature is too low. Ball is hard and does not rise: dough is too dry or frying temperature is too low.